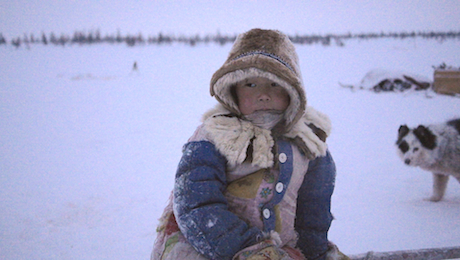 Seven-year-old Zakhar lives in the remote north of Siberia. This year, a teacher is moving in with his family to homeschool him. 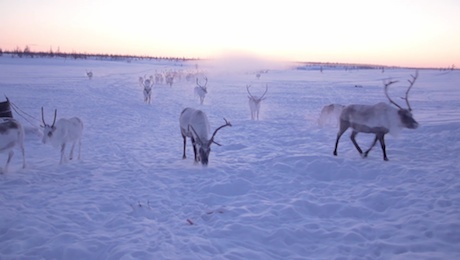 An observational film against a backdrop of the vast, snow covered tundra. The Zharkov family—father, mother and two young sons—belong to the Dolgan community, one of the last indigenous peoples pursuing their traditional nomadic life in the extreme north of Siberia. The children used to be sent to boarding school, where they became estranged from their family and culture, but nowadays they can get homeschooling from teachers assigned to them by the Russian authorities. Seven-year-old Zakhar and his older brother Prokopy are the protagonists in this calm, observational film. Zakhar’s first year of schooling is with Nelly, a young but serious teacher. She tells him about President Putin and the importance of mathematics, and he learns classical poems by heart. Zakhar is an inquisitive and intelligent boy. Each day, he has a hundred new questions about the world, and he’s surprised to discover that his teacher doesn’t have all the answers. These scenes take place against the backdrop of the vast, snow-covered tundra and observations of the Dolgans’ everyday activities—herding reindeer and fishing are their principal livelihoods.